Today, smartphone companies also recognize the importance of having a strong contender on the mid-range segment. To strengthen its presence on the said market, two well-known mobile manufacturers, Samsung and Huawei, have launched its new handsets – the Galaxy J8 (2018) and Nova 3i respectively. Both eyeing to give a more affordable camera-centric smartphone to consumers, the rivals also have the same asking price of Php15,990. So, we’re putting them on our own battle sheet to see which phone deserves more your attention once you consider getting a new one. Looking back, our team recently said that both Samsung and Huawei might have the best Android phones available in the local market yet through their flagship handsets – the Galaxy S9+ and P20 Pro. Now, let’s jump off from their premium products down to their mid-range units named as the Samsung Galaxy J8 (2018) and Huawei Nova 3i. Initially, Huawei gets the first point by dominating this battle’s display section. The brand equips its new Nova Star device with a 6.3-inch IPS LCD panel with 19.5:9 aspect ratio and 2340 x 1080 resolution. It also has a trendier screen as it sports a notch on top of its panel. Nevertheless, consumers can hide it on the display settings if they find it distracting. Under the hood, the Nova 3i is loaded with an A.I-ready Kirin 710 chipset and Mali-G51 with GPU Turbo. The J8, on the other hand, is powered by a dated yet still capable Snapdragon 450 processor paired with Adreno 506 graphics. The Nova 3i packs a bigger 4GB of RAM and 128GB of internal storage compared with its rival’s just 3GB and 32GB respective offerings. Both of its ROMs, however, are expandable up to 256GB via microSD card. Unfortunately, the Nova 3i failed to give users a dedicated slot for it. Moving on to our camera department, both devices have their own edge to battle out each other. The Nova 3i and J8 have dual rear cameras but the latter comes with a better setup, gearing itself with 16-megapixel f/1.7 + 5-megapixel f/1.9 main shooters. The Nova 3i bounces back through its front shooters, though. Packed with dual front sensors, it is equipped with a more capable 24-megapixel f/2.0 + 2-megapixel selfie snappers with A.I. features. Shifting our spotlight to its juice, Samsung offers a larger battery through its huge 3500mAh stamina compared with Huawei’s 3340mAh stamina. The Nova 3i runs on Android 8.1 Oreo operating system with EMUI 8.2 skin, while the Galaxy J8 flaunts the brand's Experience 9.0 skin based on Android 8.0 Oreo. Samsung has officially launched the Galaxy J8 (2018) in the Philippines. It comes with a free JBL clip and screen protector, too. Meanwhile, Huawei officially announced the arrival of the Nova 3i. Consumers who will pre-order it will get a Bluetooth speaker worth Php2,990, too. 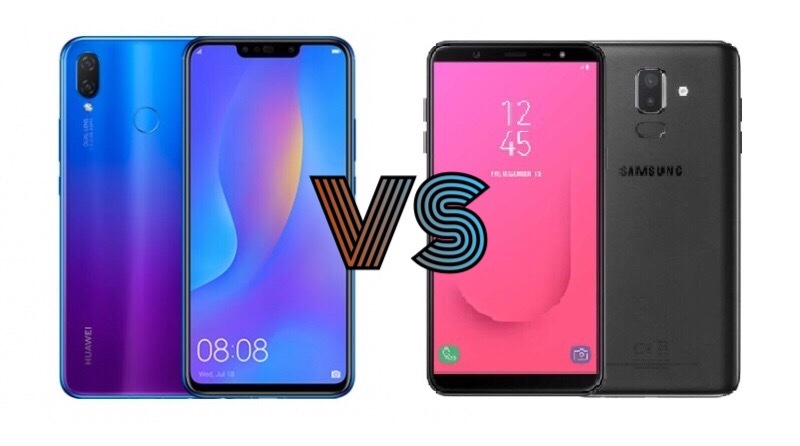 Having these things on mind, which phone deserves to get the crown as the new mid-range king? Which side are you on? Share your thoughts with us!